The result has, quite literally, changed my life. Anyone who has stumbled past my humble little blog here has no doubt heard of Penny Arcade. Linking to them from here is almost silly, like asking a fish if they've ever tried water before. Back in 2003, Penny Arcade founded a charity, run by gamers, called "Child's Play" - a gaming industry charity dedicated to improving the lives of children with toys and games in a network of over 60 hospitals worldwide. 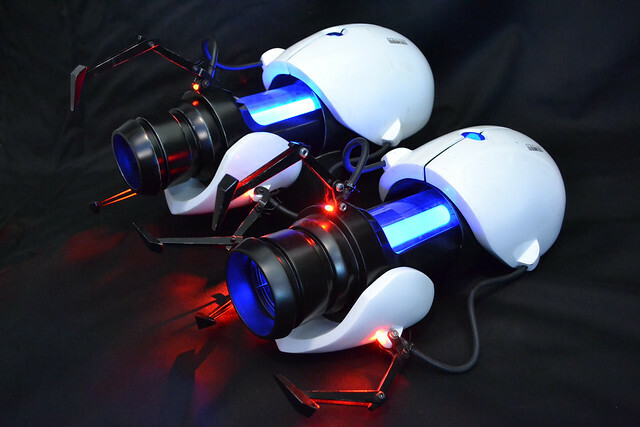 It's hard not to be cheesy when you say something like this, but making these replicas has changed my life for the better, and I wanted to do the same for someone else. 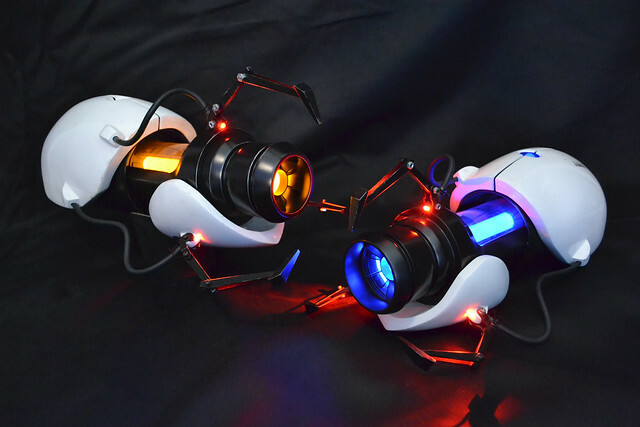 Ever since I finished my first Portal replica nearly 2 years ago, I had it in my head to make another specifically to benefit this cause. 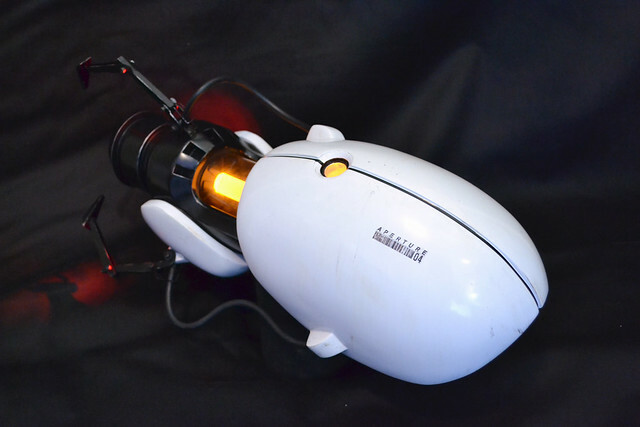 This particular replica will be auctioned off at the Child's Play charity dinner in Seattle on December 7th. 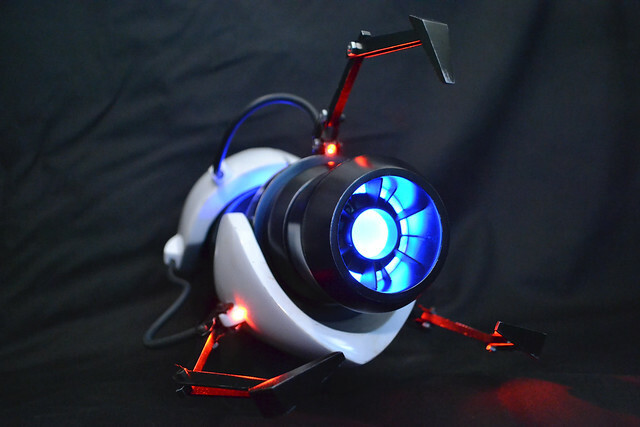 Along with it will be a custom base signed by the guys at Valve! With that heaping pressure piled on, I really had to make sure this thing turned out good. 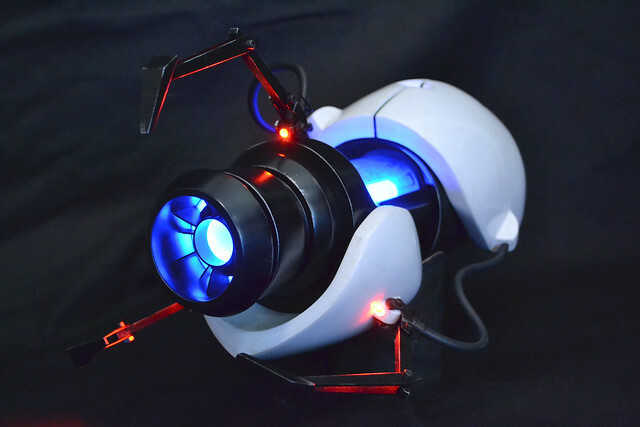 What follows is a more involved build log of the process, now that I know what I'm doing a hell of a lot better than when I first took a stab at making the Portal Gun. 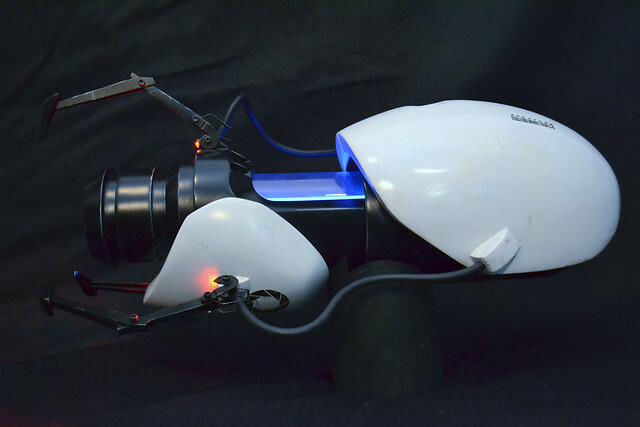 Initially, my aim was to duplicate as many parts of the original Portal Gun (we'll call this "V1" for typing purposes) as possible. 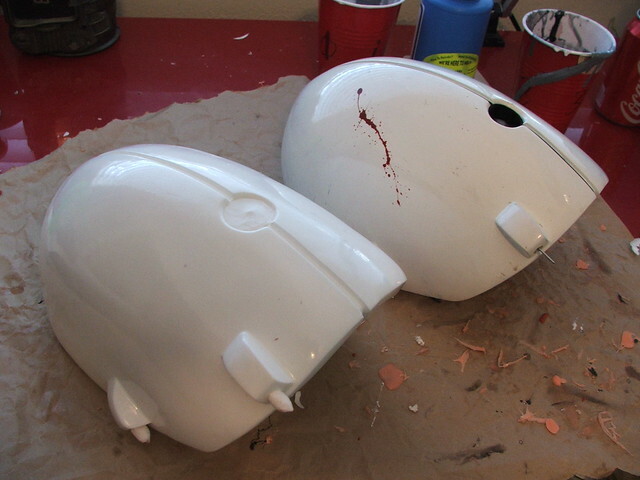 I popped off the front and rear casings and set about making a few molds. 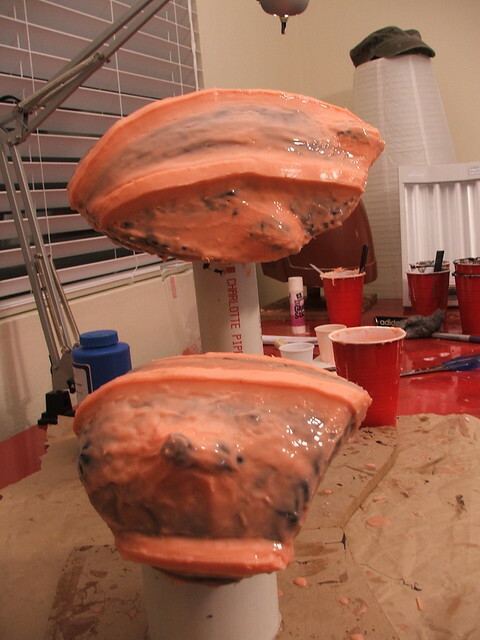 These were made with brush-on Rebound 25 silicone, and the mold jackets were made using fiberglass. 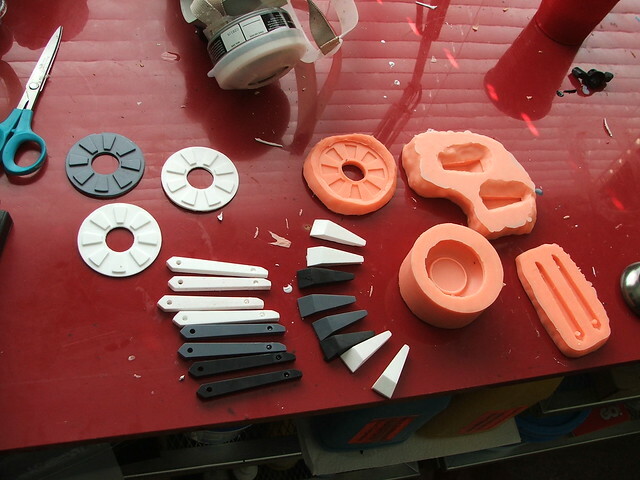 While the whole project was blown apart, I molded some of the smaller detail pieces as well. 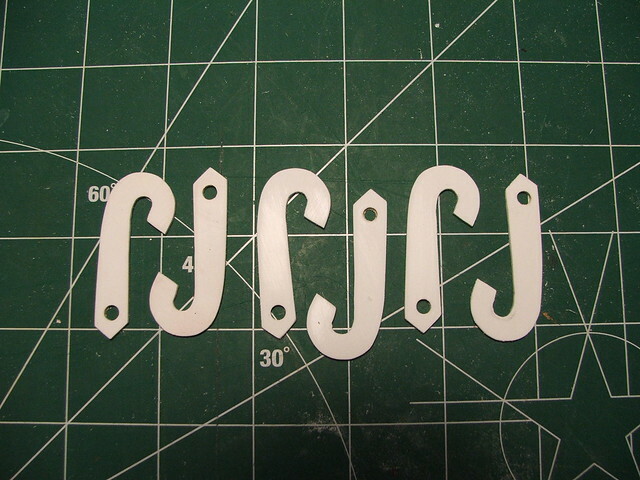 These are the prongs and center barrel chamber plates from the original build. 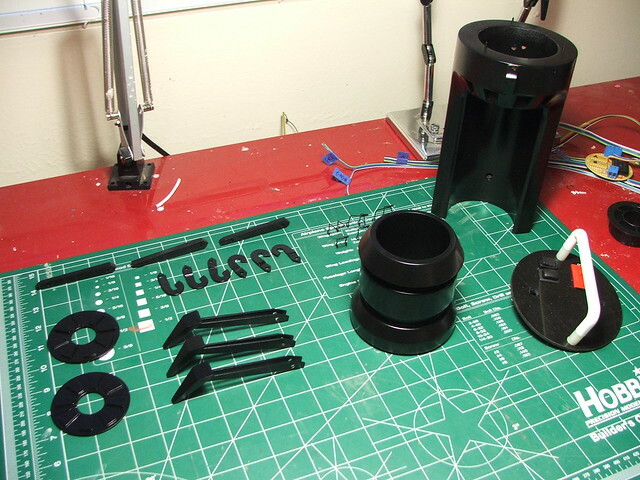 At one point, I tried to mold the entire barrel of V1 so I could pull an whole assembly as a single piece. 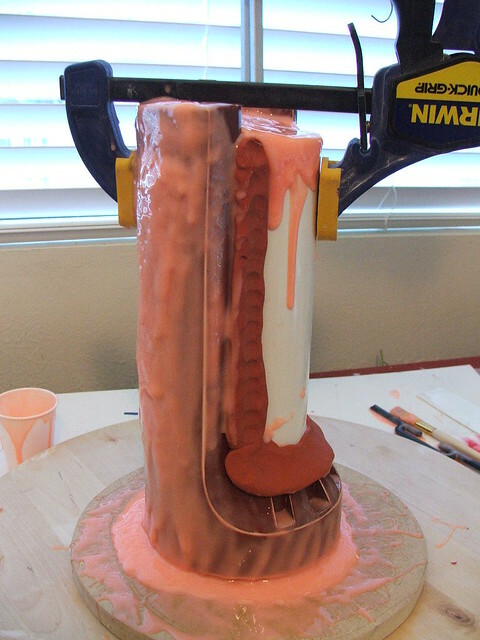 This, in retrospect, was one of the dumbest things I've ever tried to do prop-wise, and only succeeded in wasting 2 gallons of silicone, a week of my life, and severely damaging the barrel trying to extract it. I had to try something new... Or, rather, try something old that I knew how to do a lot more precisely this time. 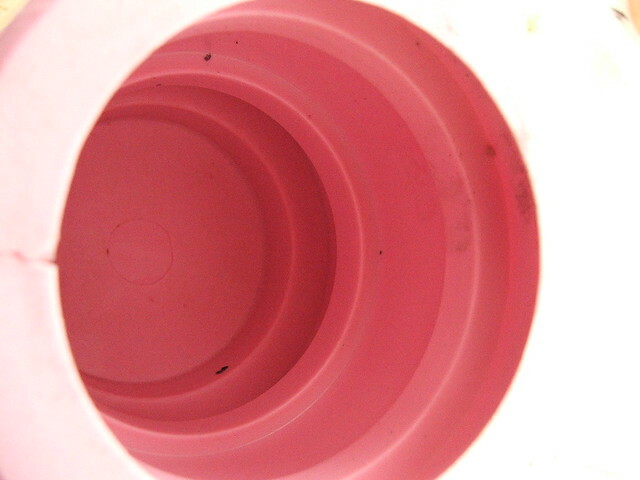 Reaching back to the way V1 was constructed, I went to purchase some PVC pipe. 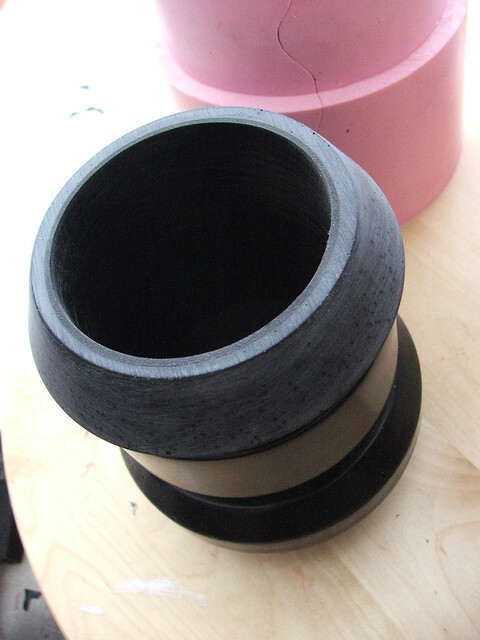 2 pieces were notched and set inside one another to create the "middle" section of the barrel. One of the more annoying things encountered when making V1 was cutting the squared recesses into the front of the barrel. 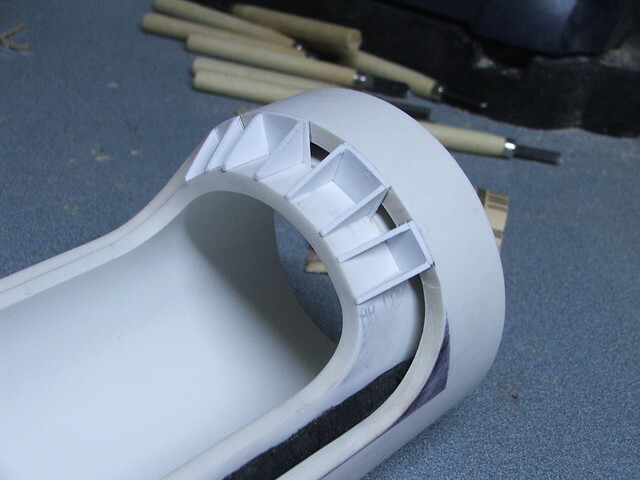 This time, I glued small styrene dams in place, sanding them down at an angle before filling the middle cavity. 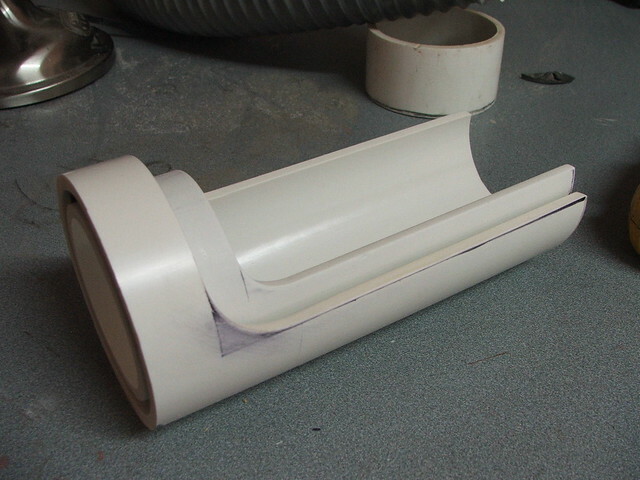 The space between the PVC was then filled with apoxie sculpt and sanded flush. 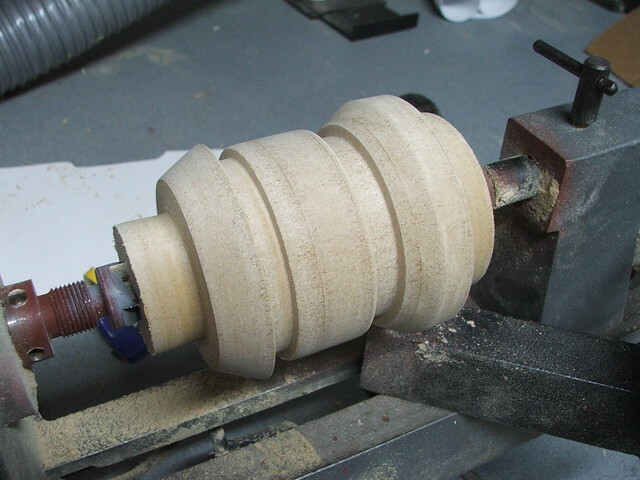 For the front most barrel section, I glued 7 discs of MDF together and settled in for some quality time with my lathe. 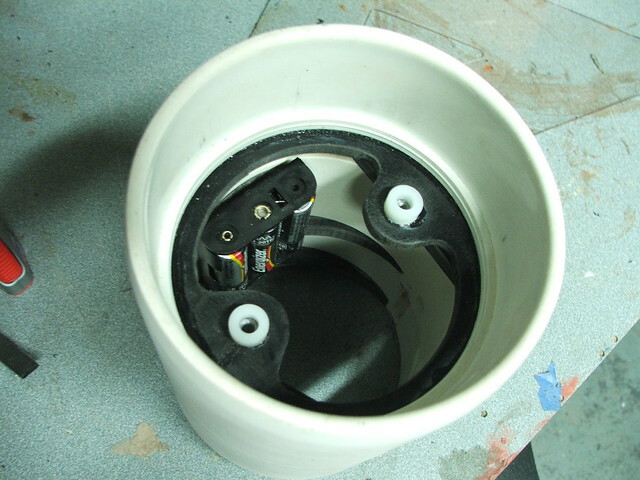 This "plug" wasn't made hollow; that would be a hurdle taken care of during the casting process. 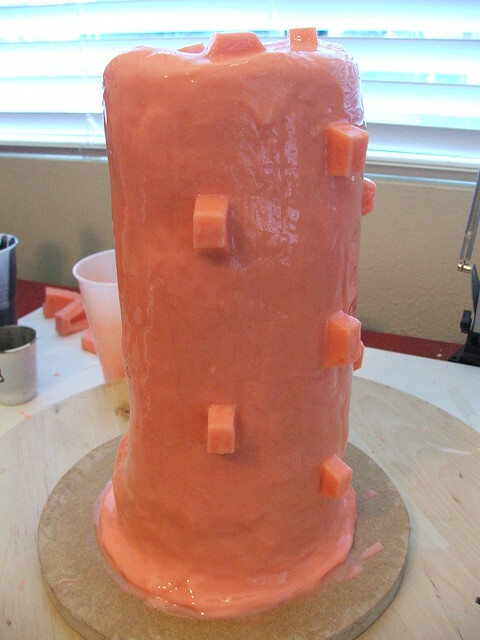 The casings weren't perfect though, and needed some filler to even out a few flat spots. 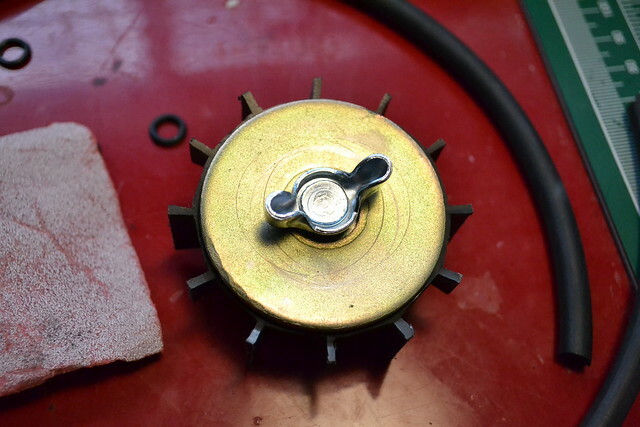 I also decided to make a more precise edge for the upper indicator light. 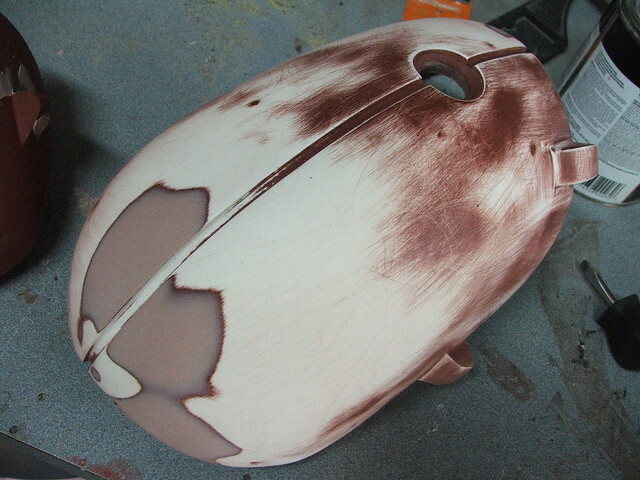 On V1, this piece was made using a hand dremel tool. 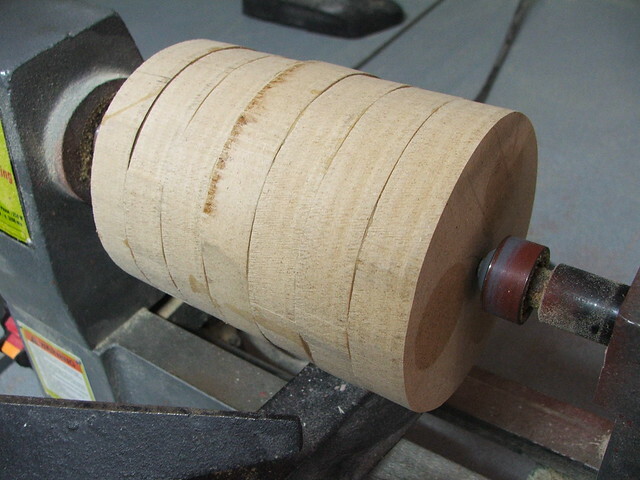 Now that I have a lathe, I wanted a true circular part with an even edge, so a new piece was made from sintra and epoxied into place. 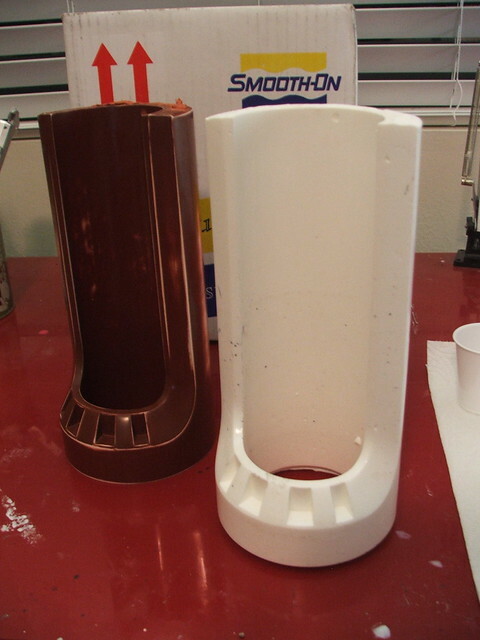 The barrel pieces then went under the rubber to have some molds made. The central barrel was the trickiest, but thanks to the guys over at the Replica Prop Forum lending me some advice, I was able to get it figured out. 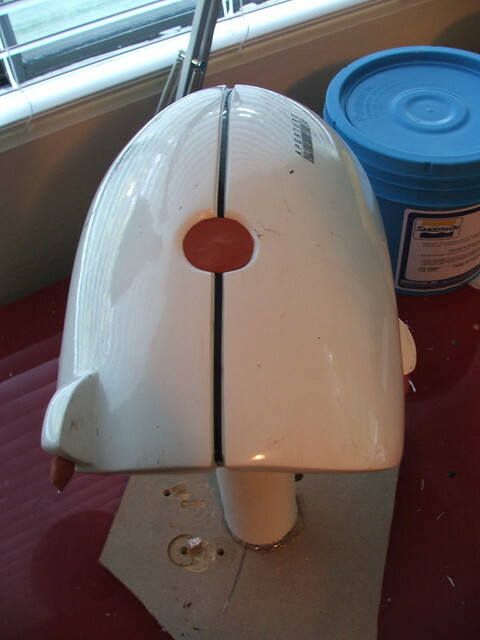 The front barrel was molded from the back side while the "front" was used as the pour area. 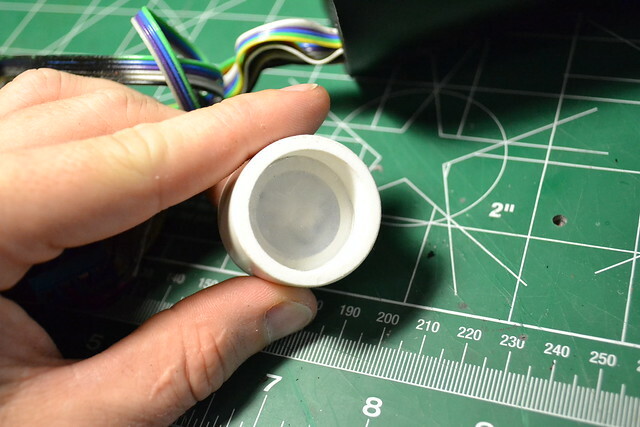 By pouring in a very small amount of resin, then inserting a 2.75" diameter tube, I was able to create the hollow area in the middle of the barrel. After the small resin at the base cured, I poured in more around the surrounding edges, eventually making the entire hollow form. 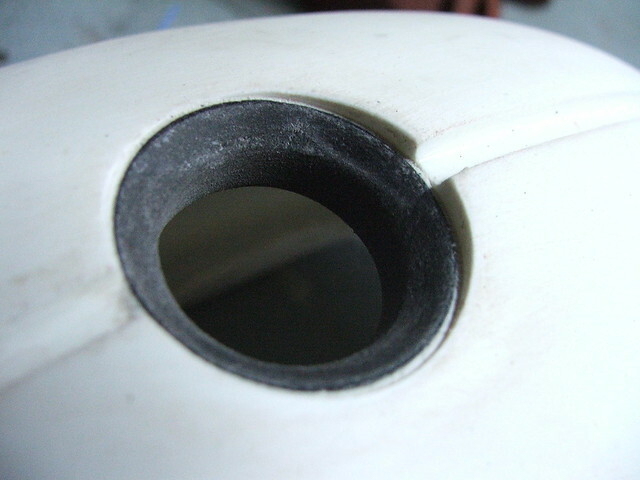 You can see the inserted tube in the shot below as a different color black than the resin surrounding it. 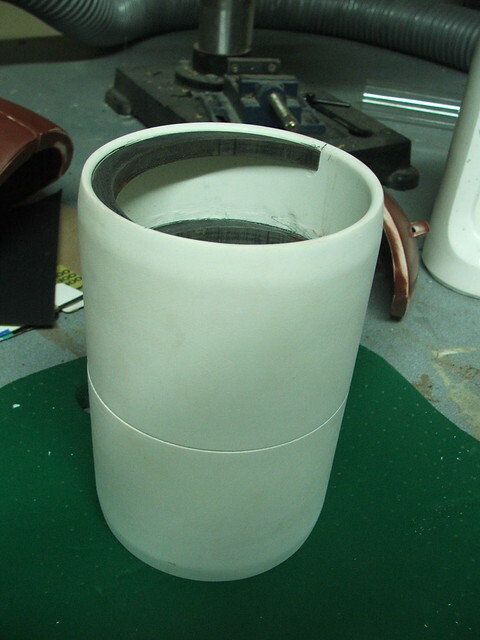 The rear-most section of the barrel was created, as before, with two 4" PVC couplers epoxied together. 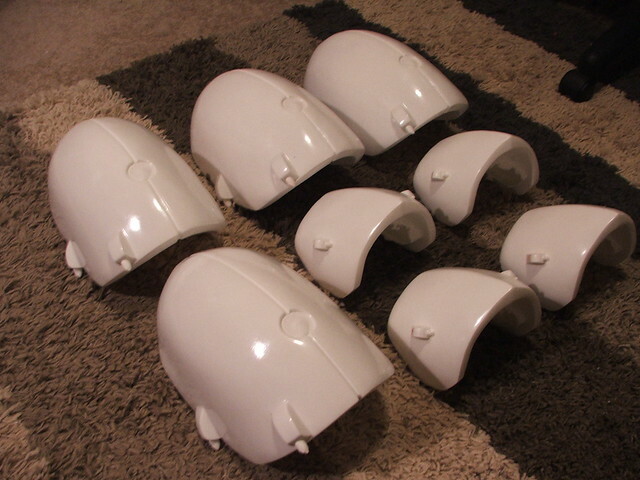 I created a myriad of mounting points with T-nuts and sintra so the entire replica could be painted in sections and assembled later. 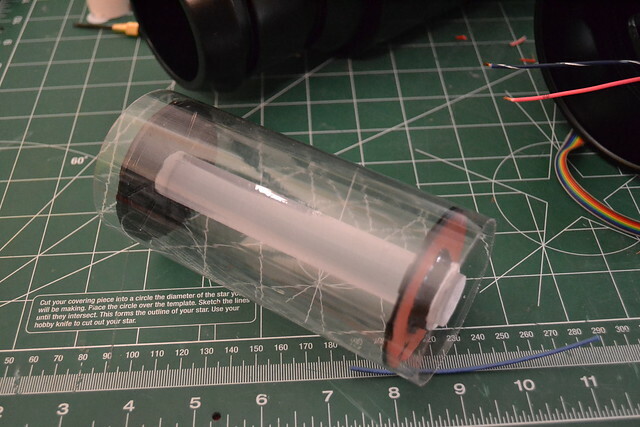 I started referring to this part of the build as the "chassis" since all of the electronic components will live here and it serves as the mounting point for all of the rest of the gun pieces. The claws were modified from V1 rather heavily. 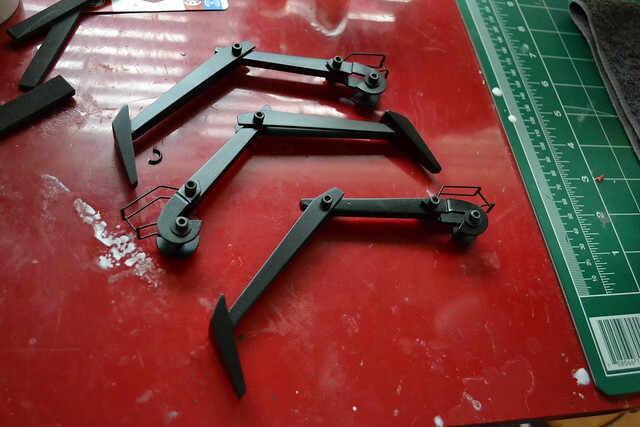 A reader on my blog (who happens to be building his own ASHPD as well) sent me some very high-resolution pics of the claws and their mounting areas. 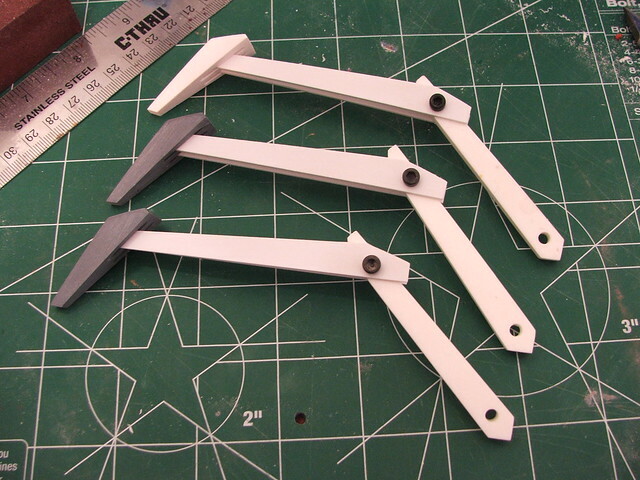 I used some components, and rebuilt others, to get the pieces below. 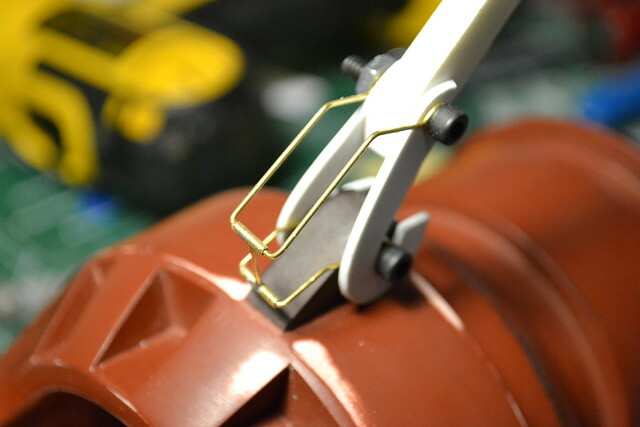 The biggest change in the claws were the wire "cages" that encase the hoses running the length of the gun exterior. 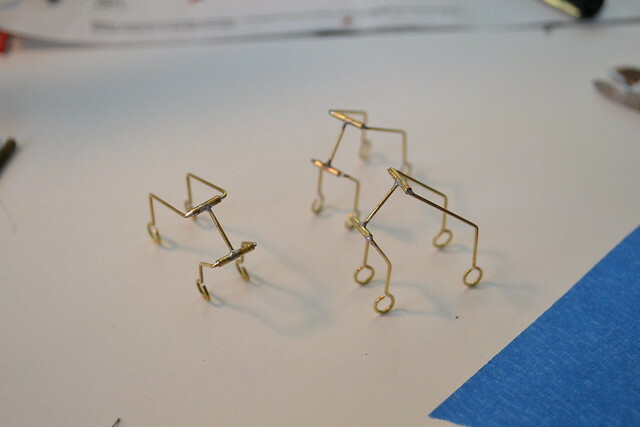 These were built from brass wire and brazed together. 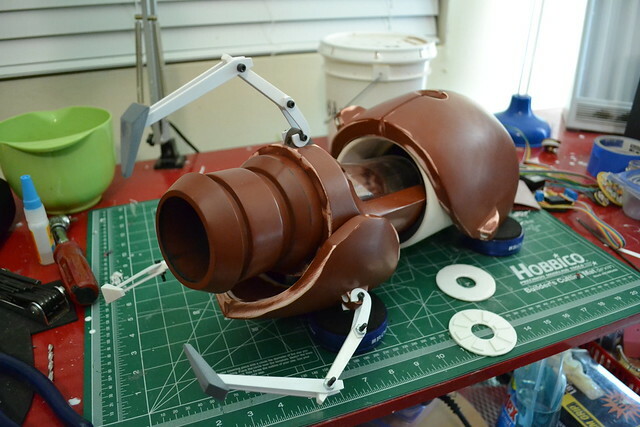 Quick test fit of all the components! 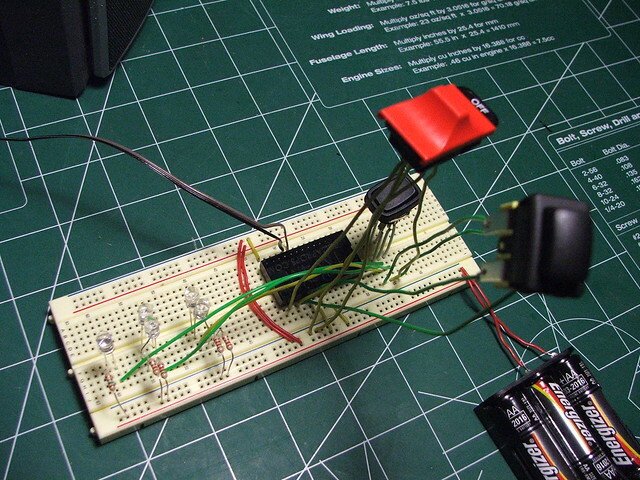 Before paint, I had to sort out electronics. This gun would light up as V1 did, but I wanted to include the sounds from the game as well. 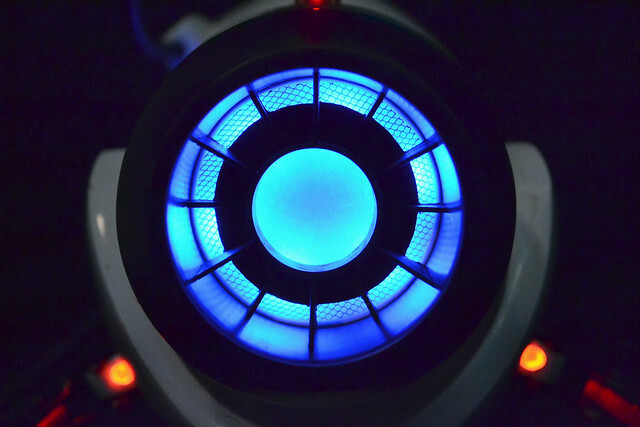 There would be a "boot up" noise when turning the gun on, individual firing noises for blue and orange portals, and a "fizzle" noise when turning it off. This gun is being created for a very special cause, so I wanted it to have some very special features. 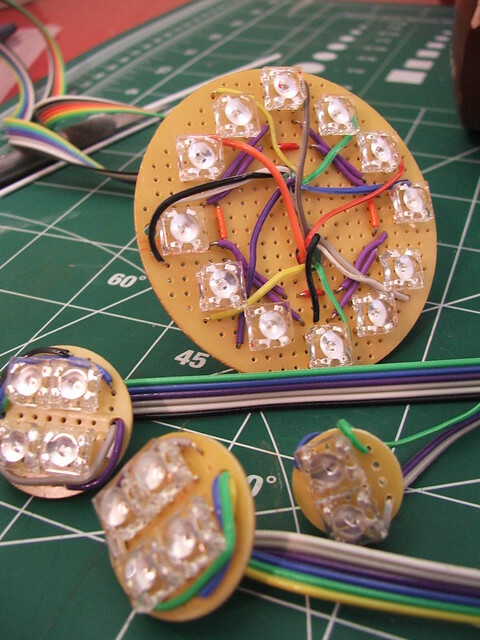 The LED board were made from simple perfboard and ribbon cable, using 5mm "piranha" style LEDs for illumination. 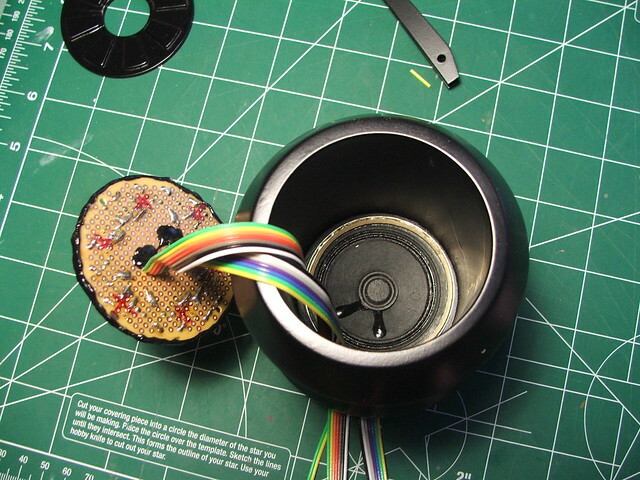 replicaprops.com handled the creation of the sound chip. All I had to do was provide .wav files and let them know how I wanted it triggered, and a week later I got my pre-programed chip & amp in the mail. Great guys to work with and very fast service. 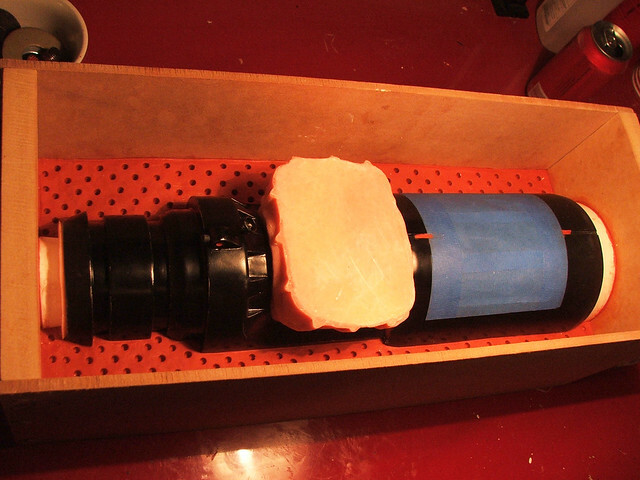 Below is a video of the first "proof-of-theory" test fire. 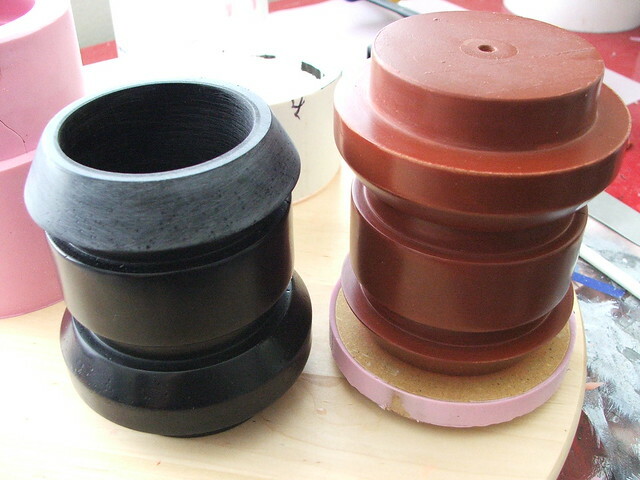 A 2.5" speaker lives at the base of the central barrel. 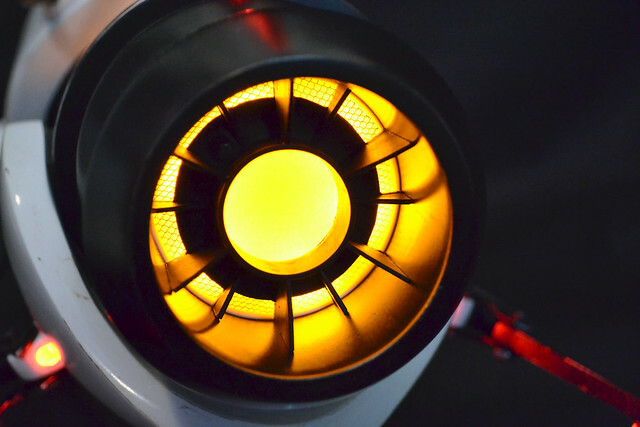 The cool thing about the gun design is that the long, continuous chamber provides rather fortunate acoustics, amplifying the volume of the sound effects really well and projecting them forwards. 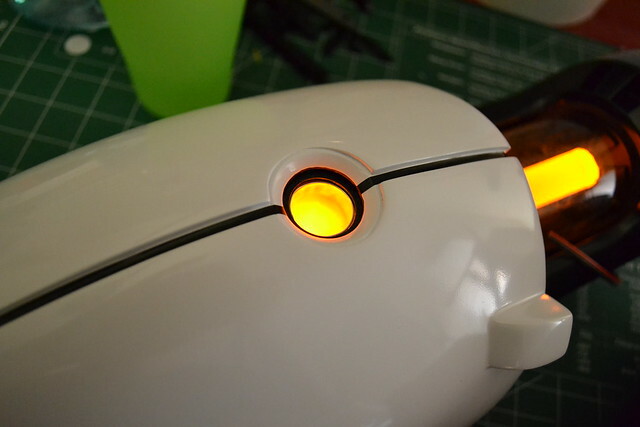 From the back of the gun, this switch plate controls the illumination and sound effects. 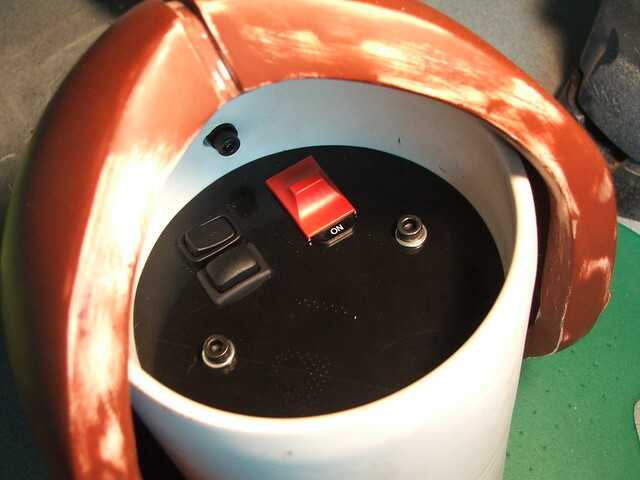 The red switch on the right turns the gun on and off, while the two black switches on the left control which portal color is selected, and the sound effects for firing. 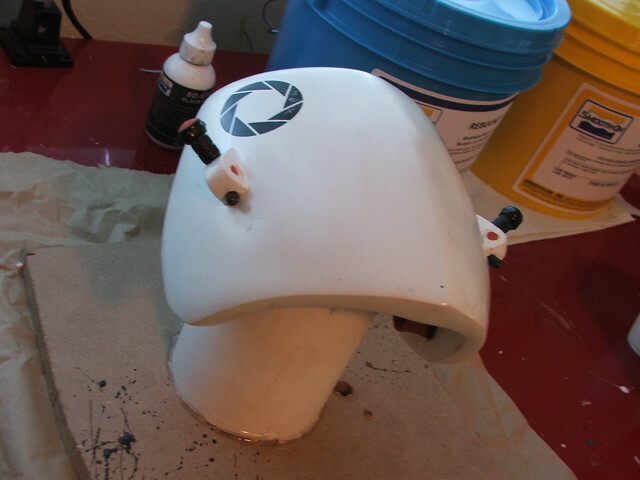 Now that the electronics were good to go, the rest of the parts got their paint topcoat. 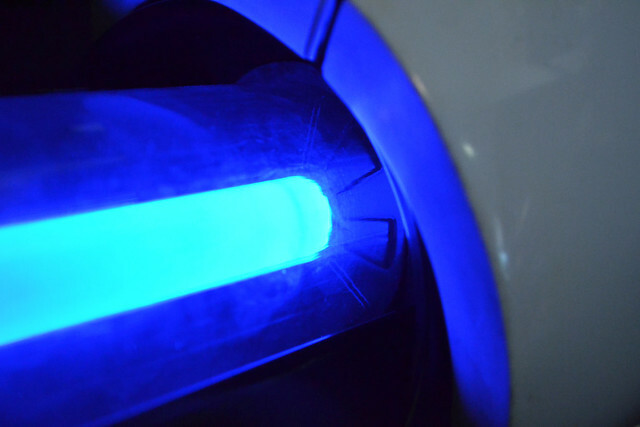 As with V1, an acrylic plunger handle was sourced to serve as the central illuminated chamber. 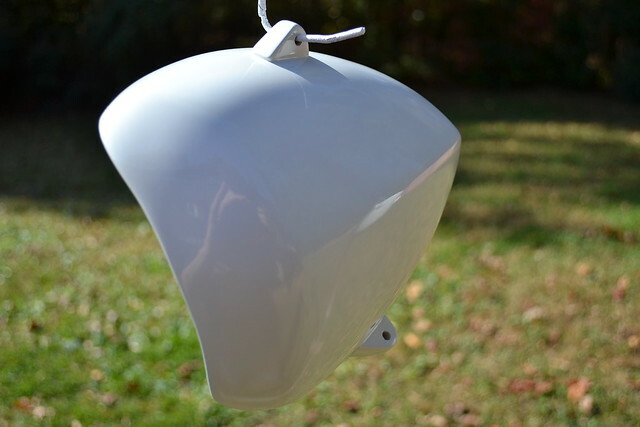 8 LEDs situated at the ends (4 of each color) keep the illumination clean and uniform. 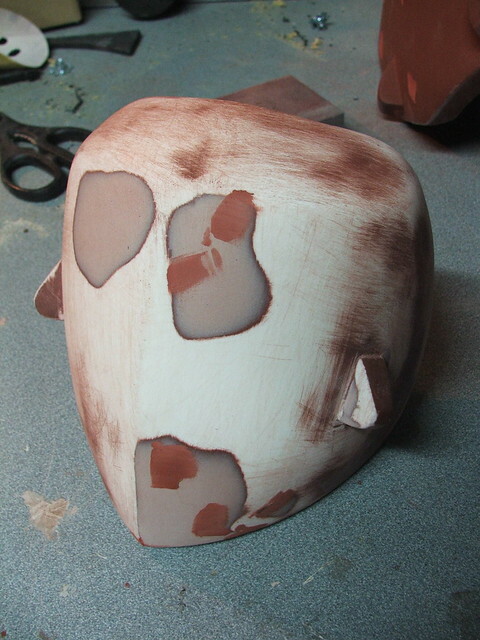 The piece was "frosted" for better light diffusion by buffing it with 600 grit sandpaper. The revised upper indicator received a similar treatment. 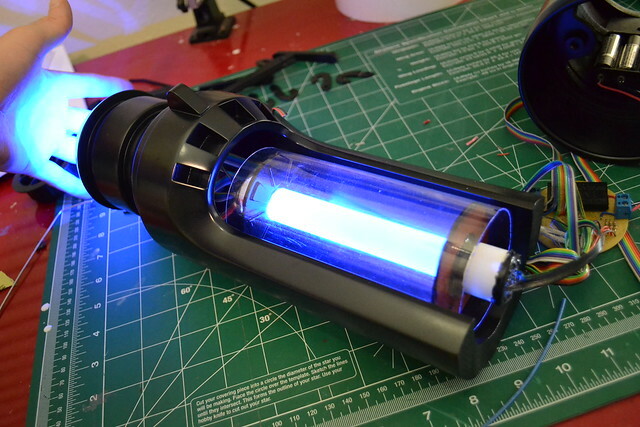 All of the LEDs were set into PVC sockets so they could easily be plugged into their acrylic rod parts. 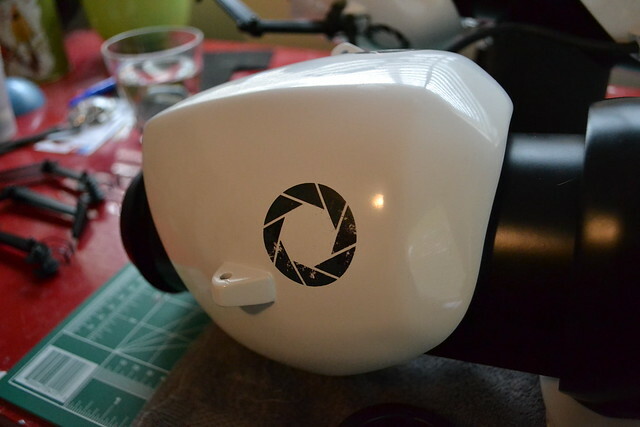 Decals were, as before, made with water-slide decal paper printed from a laserjet printer. These work best over light colors. 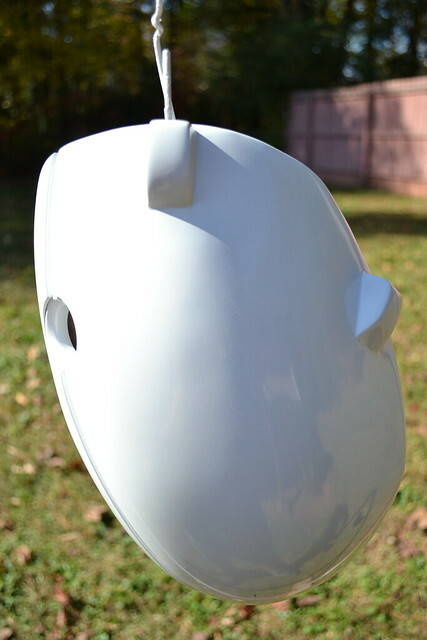 Weathering to the decals was done in photoshop - they're actually printed to look used. 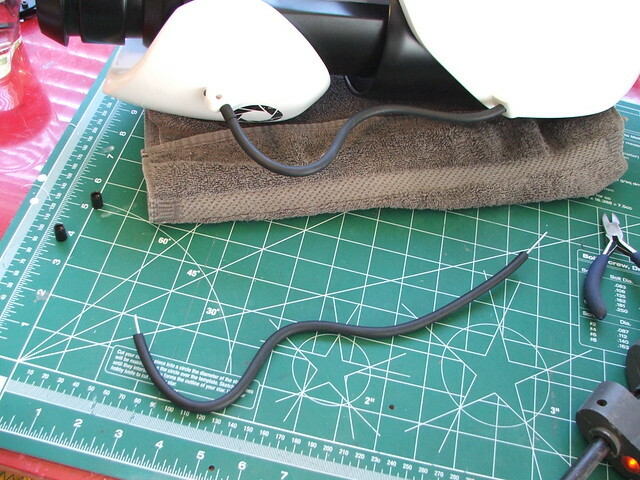 The rubber lines running the length of the side of the gun were made from automotive windshield washer tubing with sculpting armature wire inside to keep its bent shape. 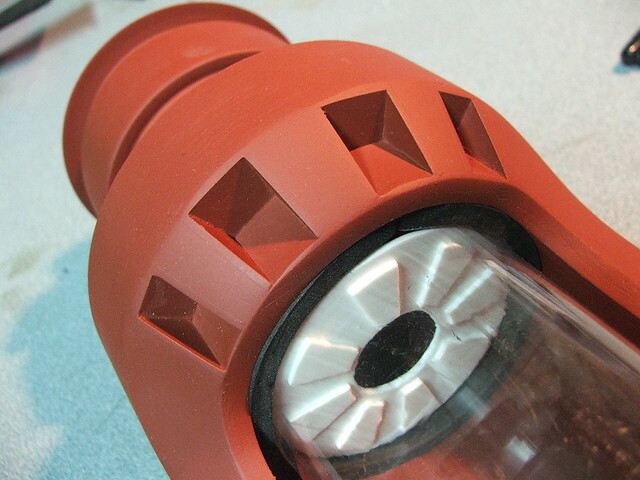 A paper spindle provided the the barrel insert as a finishing touch. I had used one of these in V1 but the barrel on that gun is nearly .5" wider. There was a lot of trimming involved to get this thing in there. 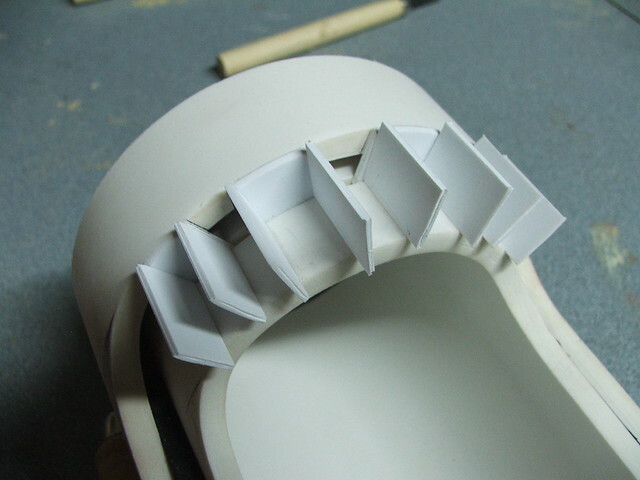 For added texture, I used some thin gauge sculpting mesh as a "screen" behind the insert. 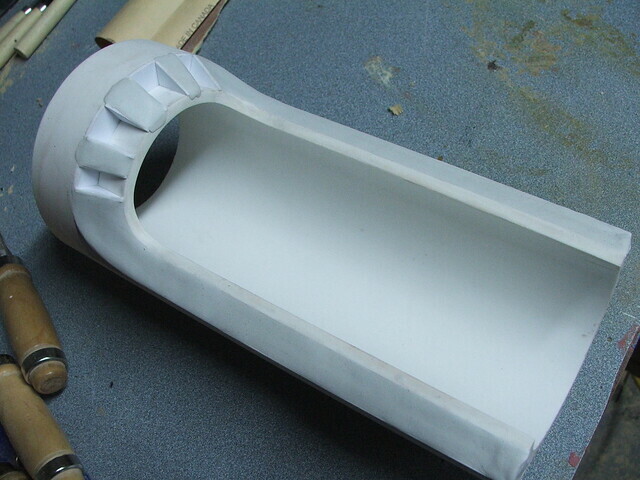 Foam padding was used to diffuse the LEDs into a more even glow. 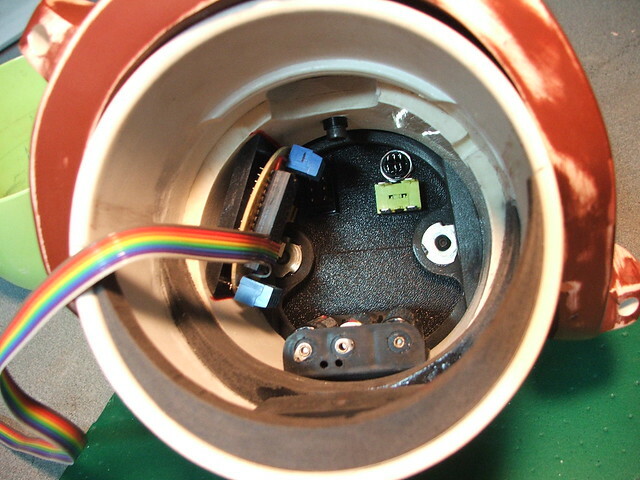 Illumination and first test-firing after final assembly! 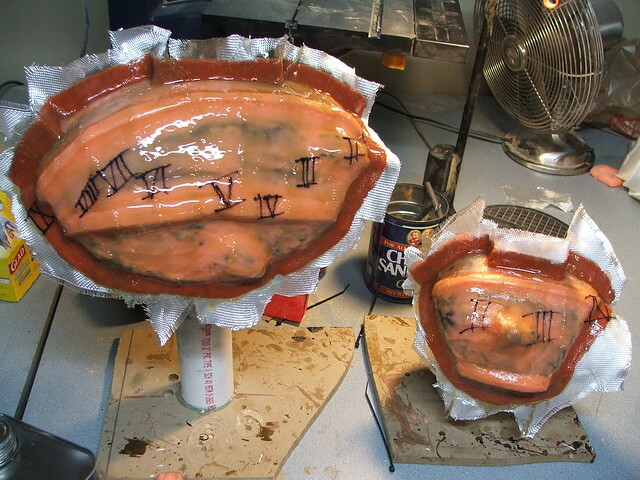 V2 then got a very light coat of weathering, and I decided to not include the blood splatter from V1. This is a piece direct from the game, and as much as I love the narrative that detail gives my own personal ASHPD, I decided to keep this one "clean." 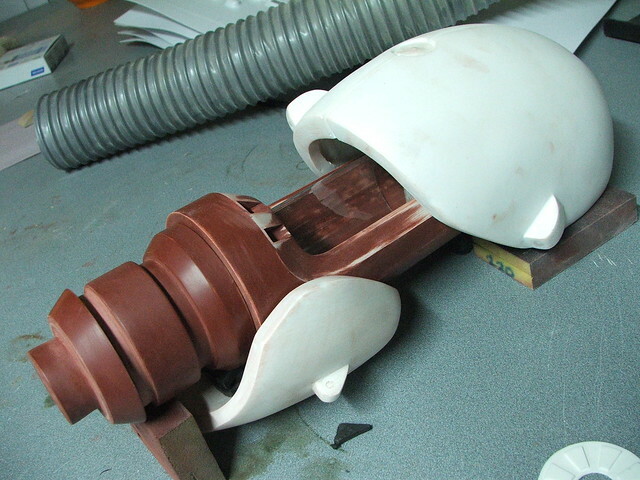 I'll need to update this post in about a week, as there is a custom base in the works as well. 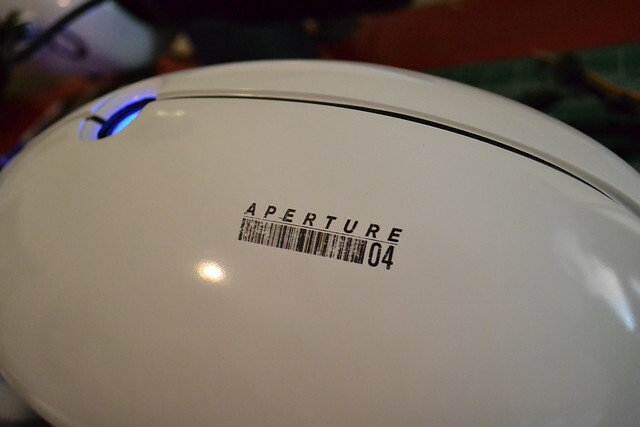 This will be signed by members of Valve (and me!) before the final gun goes on auction at the Child's Play charity dinner, December 7th. I'll be sure to post an update as soon as the auction is over and let everyone know how it went. 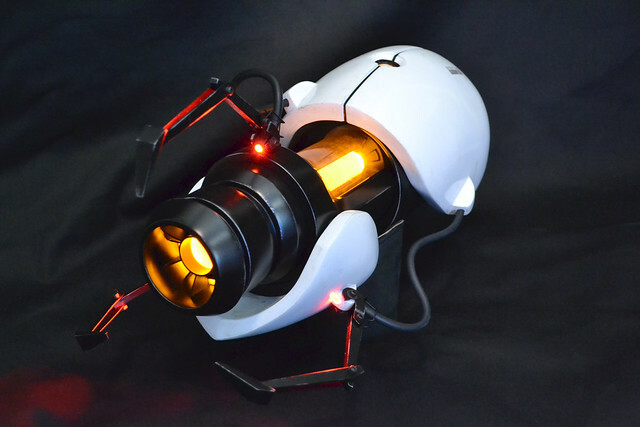 Some shots of the new Portal Gun, V2! And a couple next to her twin. Hard to believe its almost been 2 years already. To everyone that subscribes, comments, follows along or even comes by the page, thanks for helping to build my little corner of the internet. You definitely motivate me to do great things. More pictures available on my Flickr page. Thanks for reading!